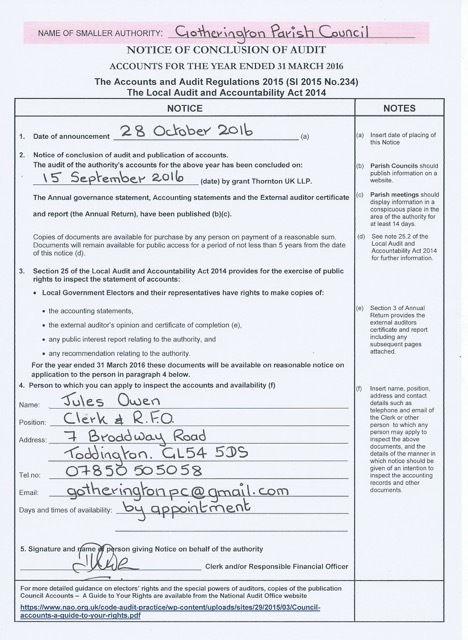 Each year the smaller authority’s Annual Governance and Accountability Return (AGAR) needs to be reviewed by an external auditor appointed by Smaller Authorities’ Audit Appointments Ltd. The unaudited AGAR has been published below, as it has yet to be reviewed by the appointed auditor, it is subject to change as a result of that review. Procedures for the public to inspect financial documents relating to the year ending 31 March 2017 and related financial papers can be found by clicking here. Procedures for the public to inspect financial documents relating to the year ending 31 March 2016 and related financial papers. Minutes of Council Meetings contain details of all payments made. Councillor responsibilities, which were agreed and published, can be viewed in the AGM 2016 minutes. The assets of the Council include the John Woolley Pavilion, Freemans Field, Rex Rhodes Buildings and strips of land in Lawrence’s Meadow and Ashmead Drive.